← Stock shipment has arrived! 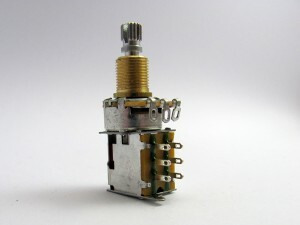 The first of the new products to be put into use on one of my guitars is a 500k linear* push/push pot. I have been waiting for these to arrive to use on my La Cabronita S1 switch alternative wiring. 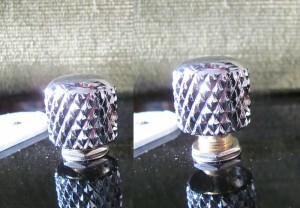 The functionality/layout is identical to the push/pull pots with the added benefit of being easier to use with hard to grip knobs. The construction of these is slightly different – they have a 9.4mm brass shank, so you will need a 9.5mm hole in your guitar body/control plate. I’m not a great fan of soldering, but I do think it’s a skill well worth acquiring. I knew this job was going to test my skill and patience as the tabs on the switch are very small and there is very little room in the cavity to fit the new capacitor circuit (stock wiring to the left). I decided it would be easiest to replace the entire loom. That way I could replace the original by just switching the pickup connections if I didn’t like the results. 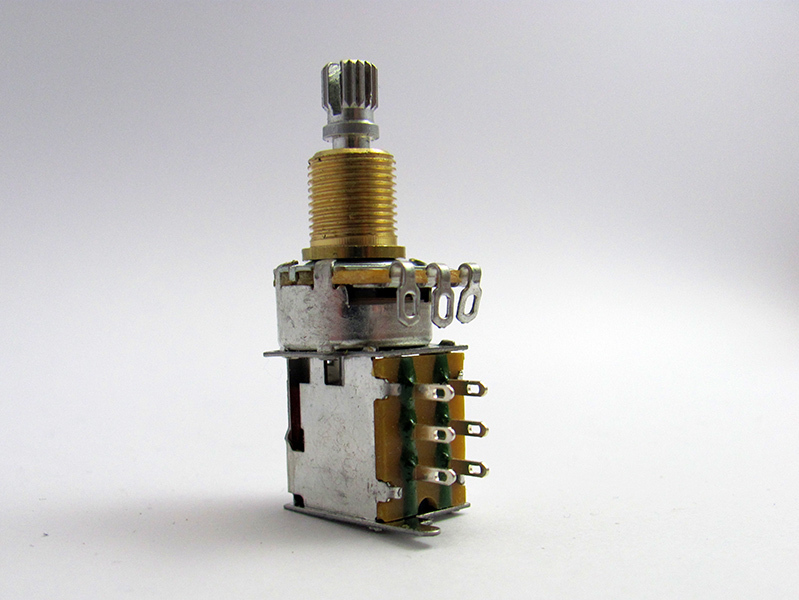 I was surprised to find a solid shaft Alpha potentiometer fitted as standard. I thought Fender always used CTS pots, but it no longer seems to be the case. No complaints from me – I use Alpha pots in all my builds. There are white, red (live) and bare (ground) wires. 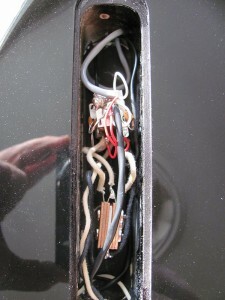 (Is the white wire a ground for the pickup cover?) 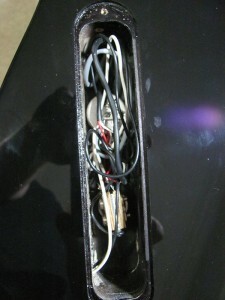 The pickup wires were grounded together on the pot, which made it very easy to remove all in one go. I wired the new components and capacitors together outside the guitar (wiring diagram). Tip – work centre out and bottom up, or you will find something in your way at an inconvenient moment! I used vintage cloth covered wire, just because I like the way it looks. I grounded everything to the bottom of the switch – it was actually easier than I anticipated – the tabs with more than one wire were the frustrating ones! There is quite a bit extra wire on the pickups – if I was certain I was never selling this guitar or switching the pickups I would probably cut it back to free up some space in the cavity. As it is I rearranged the wires to give a little more room. I think it took me an hour, start to finish. Someone with more dexterity/experience would take far less time. All three positions produce noticeably different tones from the stock model with the switch engaged. I’m a fan of the cocked wah/Eldred mod, and the bridge circuit on this is, if I am not mistaken, a modified Eldred mod (2 x .0033uF capacitors in parallel). The honk is there when the circuit is engaged, even at low gain/light breakup. The neck position is slightly less pronounced however I’m pretty sure it will come into its own with gain. Definitely a worthwhile modification. I am very happy with the push/push pots. They are extremely well made and are very easy to use. I think the brass shank looks very cool (yes, I am superficial). The picture of the off/on comparison was taken straight after fitting the knob – the pot can be lowered back into the body more, but I don’t think I’ll bother. *I use linear pots for volume. I know Fender generally uses audio/log for both volume and tone, but as I am just a bedroom hack, having an even sweep throughout the volume range is more important to me than being able to clean up my amp by rolling off the volume a hair. YMMV. 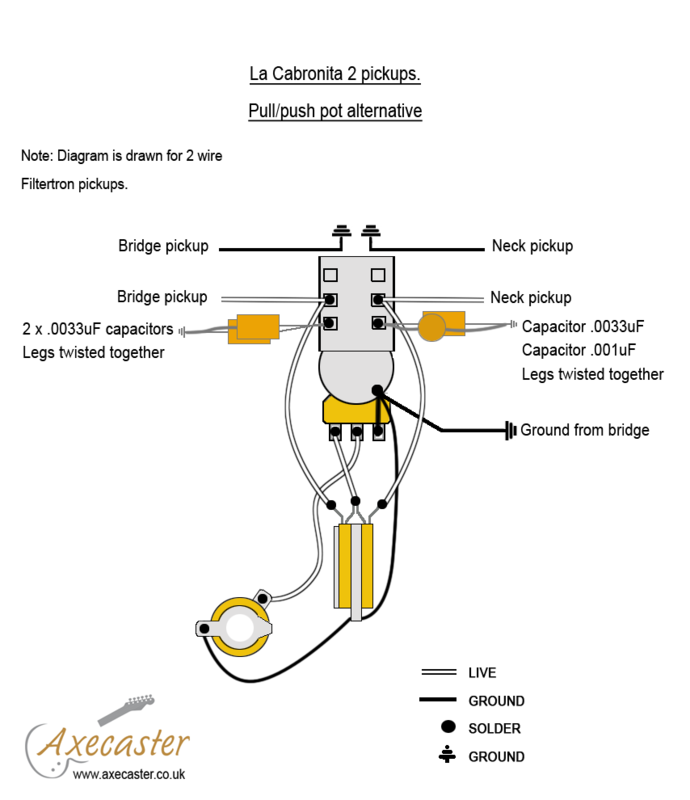 This entry was posted in Fender La Cabronita Modifications, Product updates and tagged Axecaster, Fender, Hardware, La Cabronita, mods, Products, S1 switch, Telecaster. Bookmark the permalink. I need some help please. Followed the instructions but I have 2 issues. 1. When switch is engaged I get my normal sounds. With switch in the normal down position I am getting next to nothing soundwise. 2. The knob on my cabronita does not let me engage push/push. When I try to push it is already too close to the body. Do I need to scrape out any work under the control to give me more clearance. Regarding the wiring you will have to double check everything to make sure it is all connected properly – a missed connection or incorrect ground can mess things up and it’s very easy to get something shorting across a connection when everything is so close together. Did you mean to wire it so the capacitors are out of the circuit when the switch is up? That’s the reverse to the diagram, although probably a more logical setup for a gigging musician as that means less stress on the switches locking mechanism if the guitar is played in “natural” mode most of the time. 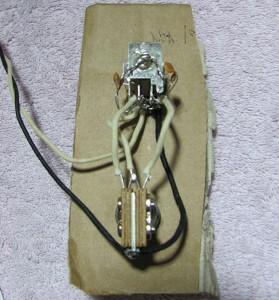 Regarding the switch engaging, (assuming a Fender body) the body is thin enough for the knob to have enough clearance to engage the switch. You may have to adjust the nut under the body or remove it entirely to allow more of the thread to come through. Due to the nature of the push/push the knob has to sit a little higher than usual – when engaging from the down position the switch pushes down a little to release the shaft. If you prefer the knob to sit low to the body when the switch is in the down position a pull/push switch would be a better option as the down position is the lowest point of travel. The pictures of my install are on a Fender and the switch engages fine – I could even lower it towards the body a bit and still have it function. I’ve been looking around for mods for my old Squier 51 – i had previously turned it into a single pickup (HB sized P90) with a vol and a varitone switch, but am now considering putting in a Tele neck pickup. Given that the S51 control plate only has space for two pots, I was thinking of doing the George Lynch wiring mod from the Seymour Duncan website – i.e. using a push/pull or push/push volume knob as a pickup selector. The only trouble with this is that I will not be able to select the middle position – i.e. both pickups on. Stumbled across your page on the La Cabronita mod, and am intrigued. I wouldn’t mind having the alternative tone presets and sacrificing a proper tone control, but gaining the use of all three positions. Basically, ending up with a guitar with 6 preset sounds. Which is fine – i liked the varitone setup i originally had, but it was troublesome skipping between the notches to get to the position i wanted. And it turned out that I only used maybe 3-4 of the 6 positions available anyway. The push/push option here sounds like a more user friendly solution. My question would be this – what capacitor combinations/values would you recommend given my pickup choices (i.e. tele neck pickup, and HB sized P90 at bridge). 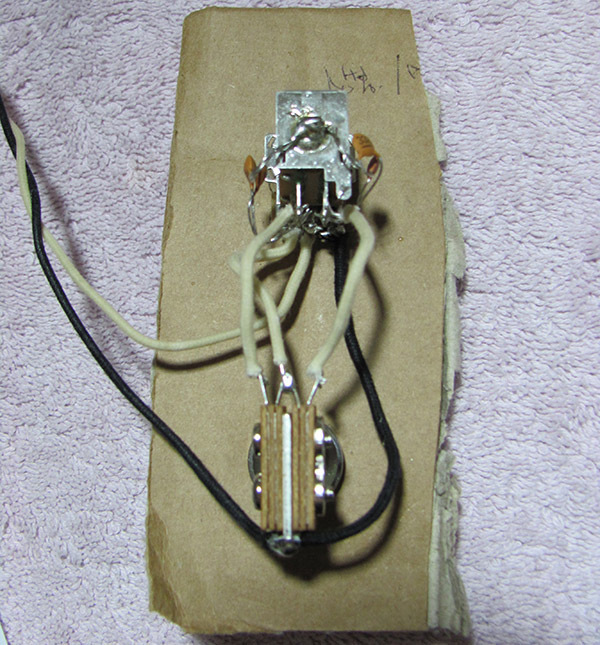 If it helps, the tele neck pickup is a BK Brown Sugar, and the bridge is a BK Missisippi Queen. Using a standard tone knob setup as a reference, I would imagine i would be aiming for a setting about halfway between fully on and fully off. Also – given my pickup choices (which are single coils, incl the P90) should I be using a 250k pot instead? Thanks in advance – if this works this might end up being a fun little guitar! I’m no expert on wiring or pickups. Gibson I think go with 300K pots with P90sbut a quick read of some forums seems there is no real consensus although some say 500K gives better clarity. I’m not sure how that will react with the Brown Sugar though – it may be too bright. Caps I would use the La Cabronita values as they are – Filtertrons are humbuckers but they are not very powerful and are nice and bright so they shouldn’t muddy things up on punchy single coils. That probably doesn’t help at all! 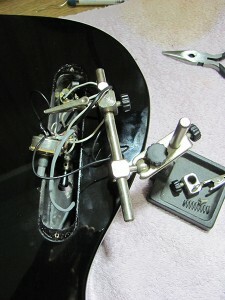 Re my question on volume pots, came across this posting about a common vol pot setup in a HSS guitar. To address the same issue – i.e. 500k vol pot being great for the HB, but too bright for the SC, the proposed solution was to wire a resistor in parallel with the SC so that the combined Resistance that the SC “sees” drops to approx 250k. For my project above, since its only a 2-pickup setup, I’m guessing I should be wiring the resistor between my hot/live wire from the SC to the lug on the push/push switch. Or perhaps between that lug and the lug on the three-way switch. I suppose either one should be ok.
Just sharing as thought this might be interesting and/or useful to others! Sorry for the late reply – there were a lot of spam comments to wade through! To be honest I don’t know – on the La Cabronitas they are a fixed tone sound and I’m not sure how the caps would react wired into a standard tone circuit. Great informative article. I am making a parts caster and like the idea of having the push/pull feature, however, this is my first build. I was wondering, would you make these wiring harness and sell the complete product, or is it possible to purchase these anywhere else? Unfortunately I don’t really have the time, and definitely don’t have the skill, to offer complete harnesses. I’m not sure if anyone offers this particular harness as standard to be honest. You could try Oil City pickups – Ash definitely offers harnesses but I’m not sure if he does custom/bespoke jobs.